Access to Energy is fundamental to our civilization. Economic and Social development is fuelling a growing demand for reliable, affordable and clean energy. Moreover, nearly 1.3 billion people or roughly a quarter of the world’s population, lack access to modern energy services. The Indian Government’s ambitious growth plans for 2022 in the energy sector, needs large shares to come from Nuclear and Ultra Mega Supercritical Thermal Power Stations. On 28th April 2017, KSB Pumps Limited inaugurated its 6th Manufacturing base – The Energy Pumps Division – at Shirwal, near Pune at the hands of Mr. U. C. Muktibodh (Director Technical – NPCIL) and Dr. Jürgen Morhard (Consulate General – Federal Republic of Germany in Mumbai). The other galaxy of dignitaries at the glittering function included key customers; suppliers and senior managements of KSB India and Germany. This inauguration signalled a new era in the history of KSB in India; as it showcased KSB‘s continued commitment towards development of High Technology engineered products to meet India’s quest for energy, through Super Critical Power Plants and Nuclear Power Plants and also embrace the “Make in India” initiative effectively. This new facility of KSB Pumps Limited is housed in an overall plot area admeasuring 100,000 sq. meters. The first phase that was inaugurated, is with a covered area of 16500 sq. meters and which has been completed in a record time of 10 months and has had the credit of a “zero accident” incidence in the over 835,903 man hours invested in various activities during the construction. KSB has plans to further expand this facility by yet another 6500 sq. meters by early 2018 to complement capacities of their Chinchwad plant and be fully prepared to sync with the emerging and accelerated growth needs of the Indian energy majors and the market needs! The third phase of this project admeasuring yet another 6500 sq. meters of covered area is for future expansion; and will be implemented, as the need arises! Key features of this plant is the material handling capabilities of up to 80 tons; power availability expandable up to 10 MW from 6MW; can easily handle products up to 13 meters height; Assembly and final aggregate is in a dust free environment by pressurizing the shop; State - of - the –art testing facilities include - hot water testing; thermal shock; dry running; string test etc. ; zero discharge facility making the plant environment friendly. We are also proposing to set a solar plant of up to 1 MW, soon! The overall investment in this project by KSB is to the tune of Rs 2500 Mio. of which we have already invested to the tune of approximately Rs 1200 Mio on this first phase! Chief Guest - Mr. Muktibodh (Technical Director NPCIL) was of full praise of this facility and acknowledged KSB’s strong role in partnering the Nuclear Program in India since 1975. He also read out a personal message of Mr S.K. Sharma (CMD – NPCIL) complimenting and congratulating KSB for this new plant which would help accelerating the “Make in India” program. 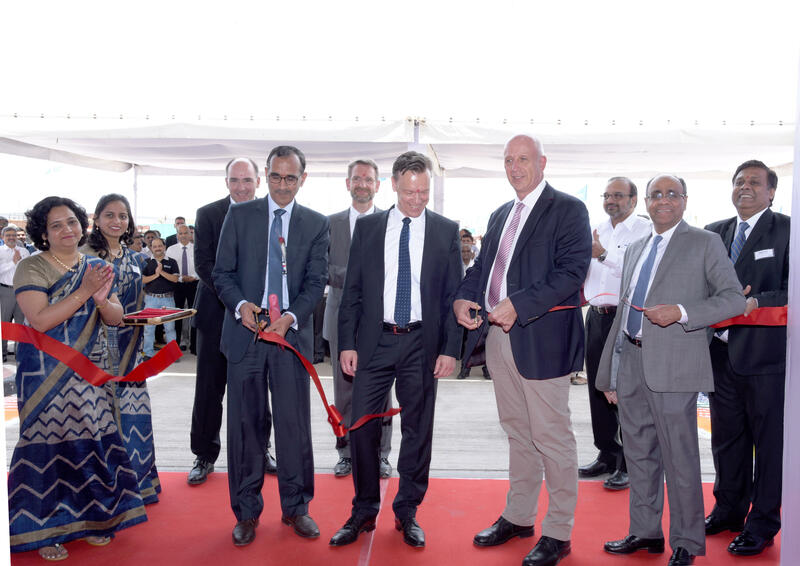 Dr Jürgen Morhard (Consulate General – Federal Republic of Germany in Mumbai) recalled his experience of KSBs reliability and solid design – with an experience he shared … while he was deputed in Togo and where he was shown a KSB installation which had been working for over 100 years! Dr Morhard also acknowledged and appreciated the very modern and futuristic look of the manufacturing plant. During his address Mr. Jain – Managing Director of KSB India said -“Whether we manufacture pumps for bore wells or for Gen-next Power Plants, the manufacturing systems and practices are such that the highest standards of customer need oriented design are seamlessly translated to world renowned manufactured quality. This commitment to innovative design translating to reproduce defect free manufacturing and we at KSB are committed to and are known for!” KSB has deployed a team of highly skilled and motivated personnel to lead the manufacture of specialized pumps to support India's plans to ramp up power generation via Super Critical and Nuclear Power plants. KSB in India has been demonstrating a track record and has been a trend setter in the design, manufacture, testing and supply of Pumps and Valves for conventional; Super-Critical as well as Nuclear power plants. What with over 8000 pumps have been supplied to the Indian Power Segment by KSB in India. In the Nuclear arena KSB has partnered NPCIL since 1975; and have been supplying pumps right from NAPS, and today have supplied Condensate Extraction Pumps, Re-heater drain Pumps, Auxiliary Boiler feed pumps, Separator Drain Pumps; Main Boiler Feed Pumps, Emergency Core Cooling Pumps, End Shield Cooling Pumps to the virtually all 235; 500 and 700 MW projects of NPCIL. The journey of introducing first’s to the conventional and super critical power plants began with the first ring section boiler feed pump HDBK 125/9 was supplied to RCF Trombay in 1980 by KSB in India! Incidentally, this pump is still in operation, even today! Then came the other firsts – For 250 MW power plant of Neyveli; 350 MW of Meenakshi; 5x800 MW supercritical power plant of Tata Mundra; 2x660 MW of Sholapur followed by Nabinagar; Darlipalli; Kudgi and Meja sites. KSB India became the 1st Indian Company to qualify as the indigenous supplier of Boiler Feed Pumps to NTPC for Super Critical Power Plants and the first BFP order from GE / Alstom for NTPC Tanda 2 X 660 MW was received. Pumps for unit 1 are currently on our testbeds and to be dispatched soon! Subsequently KSB was also selected by Toshiba – JSPL for supplying BFP’s for Harduaganj 1x660 MW project of UPRUVNL. Likewise KSB is the first indigenous qualified supplier by NTPC for their Telangana 2 X 800 MW supercritical power project. From its 5 other plants in India, KSB has been manufacturing and supplying Power Driven Centrifugal Pumps and Industrial Valves, reliably and safely, to address the needs of customers from the Water and Waste Water; Agriculture; Construction; General industries; Oil, Refineries and Petrochemicals; and Power Plants including Super Critical Power Plants and Nuclear Power plants, with great aplomb!